Big Break PEI and spring are just around the corner. Well, the wait is over! Spring is almost in the air and Big Break PEI is just around the corner. Woohoo! I have been struggling since the fall with what to do with my Tuesday nights. 🙂 I was so used to doing post-episode interviews with the Big Break Ka’anapali, Highway 18 and Big Break Michigan contestants that when Haymes and Bernie became BB X winners, I was left feeling at a loss. Well, I’ve got April 20th at 10 PM Est now in my daytimer and I’m set to start the interviews again. Here are the contestants (6 men and 6 women): Aaron Wright, Brenda McLarnon, Eugene Smith, Gerina Mendoza, Robert Read, Caroline Larsson, Derek Gillespie, Nicole Sikora, William Thompson, Blair O’Neal, Brian Skatell and Kim Kouwabunpat. Do you know any of them? I don’t, but I’m sure some of the previous BB and HY18 contestants do – golf is such a small world. I’ll ask them for tips on who would make great interviewees. Meanwhile….who do you think I should try and connect with? I definitely want to chat with fellow Canuck, Derek Gillespie. But haven’t a clue who else to add to the weekly mix of chit chat. The article below says that Golf Channel has info on their site, but I haven’t seen it yet. I guess I’ll check the bios when they are posted and then decide who looks to be the most “interesting”. Kim Kouwabunpat (27, Upland, Calif.) – Focused and driven, Kouwabunpat (pronounced “Kowa boon pat”) has the uncanny ability to pick herself up when she’s been knocked down. The former Stanford University golfer has played on professional tours all over the world in her attempt to make it to the LPGA tour. Caroline Larsson (24, Orlando, Fla.) – The Stockholm, Sweden, native is considered to be one of the most talented competitors in the field. An accomplished player on the Duramed FUTURES Tour over the last two years, she competed in the 2007 LPGA Final Qualifying Tournament. Brenda McLarnon (25, Charleston, S.C.) – The Belfast, Ireland, native is brutally honest and outspoken, and brings humor and conflict to everything she does. Having played the Duramed FUTURES Tour the last three years, she learned the sacrifice it takes to play professional golf and is ready to capitalize on the hard-earned experience. Gerina Mendoza (23, Roswell, N.M.) – Mendoza picked up the game in her late teens but is one of the most naturally gifted competitors in the series. A member of the Duramed FUTURES Tour, last year she competed in the LPGA Final Qualifying Tournament, where she missed the cut. With her length off the tee, Mendoza will be a force to be reckoned with in Big Break Prince Edward Island for both the ladies and men. Blair O’Neal (27, Tempe, Ariz.) – A four-year starter at Arizona State University, she twice won the NCAA Long Drive Championship but has been out of professional golf since 2006 pursuing a modeling career. Before leaving the fairway for the runway, she competed on numerous Tours around the world. Nicole Sikora (25, Yonkers, N.Y.) – Sikora may be the most inexperienced competitor on Big Break Prince Edward Island. After an unsuccessful rookie year on the DURAMED FUTURES Tour in 2007, she accepted a job on Wall Street as an executive assistant for a New York stock broker. Golf has taken a backseat, but now that her business career is on the fast track, she is slowly finding more time to re-devote to the game. Derek Gillespie (30, Oshawa, Ontario) – The only Canadian in the cast, Gillespie was once labeled “the next great Canadian golfer” by fellow countryman and PGA TOUR professional Mike Weir. One of the most talented and experienced in the cast, Gillespie is looking to realize his dream of playing on the PGA TOUR after many years of missed opportunities and bad breaks. Robert Read (30, Seekonk, Mass.) – Reid turned professional to play in Big Break Prince Edward Island. Read will use his humor and prodigious length to level the playing field. Quite the bomber, he has hit drives over 420 yards in long drive competitions. Eugene Smith (30, Glen Ridge, N.J.) – Smith won the 2000 NCAA Big East Championship and later was the Seton Hall Athlete of the Year in 2001. The Canadian Tour veteran once shot 59 at his home course in New Jersey in a round that included a hole in one. Brian Skatell (36, Virginia Beach, Va.) – A very confident player, Skatell prides himself on his meticulous work ethic and considers himself to be mentally strong. Though lacking the same amount of tournament experience as many of the other contestants, he firmly believes that even the best in the field can’t match his skill level. William Thompson (22, Bracey, Va.) – A self-admitted and rather obvious country boy, William “Football” Thompson will be one of the most unique personalities in the cast. The youngest competitor, his Big Break experience will be a trial by fire. Aaron Wright (31, Orlando, Fla.) – Wright put his dream of playing on the PGA TOUR on hold to serve a six-year tour of duty with the Marines, including a five-month stint in Afghanistan. In 2008, the United States Navel Academy graduate played the Hooters Tour and made the cut in a Nationwide Tour event. He lost to Tiger Woods 4&3 in the quarterfinal match of the 1992 U.S. Junior Amateur Championship. Mill River looks gorgeous! It was rated fours stars by Golf Digest Places to Play. 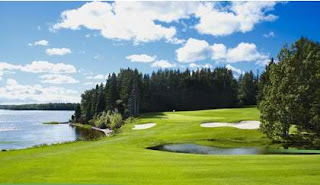 SCORE Golf Magazine rated Mill River in the Top 3 Best Golf Courses in Atlantic Canada. I have never played in PEI, but I’m going to try really hard to get their during the series so I can do some video footage of the course they are playing and share it while they’re in the midst of battle.